Individual bathroom design begins with the washing area. With six versatile washbasin solutions from 450 mm to 650 mm, ME by Starck is a minimalist range for private and public areas. A slender rim that is also found on the toilets and urinals serves as the recurring design element. The delicate edge gives the washbasins a light, almost rimless appearance, while their inner basins are conveniently deep. The vanity basin from 830 mm to 1,030 mm boasts distinctive lines and is especially flat with generous storage surfaces, while the console basin can be combined with a vanity unit or various consoles. The washbasins with pedestal or siphon cover appeal thanks to their pure, minimalist design and balanced sense of proportions. 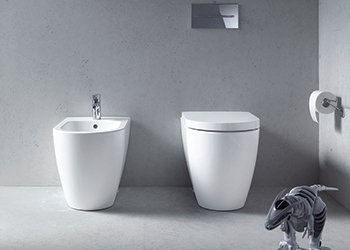 In addition to concentrating on the design, Starck and Duravit have also focused on innovative technology: new developments have made it possible to reduce the weight of the toilets and bidets in the range, resulting in attractive, sleek, self-contained components without attachment niches at the sides. The open design of the flushing rim resulting from the rimless technology offers additional convenience, as does the connection with another new item, the SensoWash Slim shower-toilet seat, which features precision hinges that are very easy to remove. This means the ceramics can be thoroughly cleaned with ease. The clear, focused design of this range is also evident in the ME urinal. With its characteristically delicate rim, the urinal is an elegant yet practical addition to private and public bathrooms alike. ME is the first Duravit range in which the urinal also boasts the innovative rimless technology. The open design of the flushing rim ensures a dynamic and powerful flow of water that rinses the entire inner surface of the urinal, while also allowing for a fast and hygienic cleaning of the ceramics. The range also features bathtubs, shower trays and accessories designed by Starck. Combining perfectly with the new L-Cube furniture range, ME by Starck lends the modern bathroom a clear aesthetic look with the French creator’s timeless signature, turning the desire for individualisation into reality.